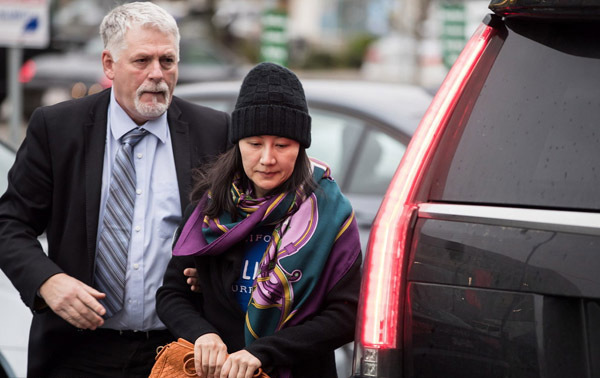 The New York Times reports, "Canada's ambassador to China came under sharp criticism on Wednesday for appearing to politicize a high-profile legal case by saying publicly that the Huawei executive Meng Wanzhou had a good chance of avoiding extradition to the United States. Speaking at a news conference for Chinese-language news media on Tuesday in Markham, Ontario, the ambassador, John McCallum, surprised seasoned observers of diplomatic protocol by offering an assessment of the case against Ms. Meng, who was arrested in December by Canadian authorities in Vancouver at the request of the United States. Referring to comments that President Trump made this year that he was willing to intercede in the case if it would help secure a trade deal with China, Mr. McCallum said that Mr. Trump's intervention, among other factors, had buttressed Ms. Meng's case to avoid extradition." The New York Times reports, "The Chinese government appeared to block [Microsoft's Bing] search engine on Wednesday, in what would be a startling renunciation of more than a decade of efforts by Microsoft to engage with Beijing to make its products available. If the block proves to be permanent, it would suggest that Western companies can do little to persuade China to give them access to what has become the world's largest internet market by users, especially at a time of increased trade and economic tensions with the United States. The Redmond, Wash., company has cooperated with local companies to provide its Windows and cloud services to win acceptance by the Chinese government. Its long-established research and development center has turned out valuable products and launched the careers of a generation of artificial-intelligence experts who have started important new companies in China." CNN reports, "In a speech at the World Economic Forum, Vice President Wang Qishan said that growth remains substantial, and that it's important for China to focus on the long term. 'There will be a lot of uncertainties in 2019, but something that is certain is that China's growth will continue and will be sustainable,' he said Wednesday. Earlier this week, China reported that its economy grew 6.6% in 2018, the slowest pace in almost three decades. Activity has been hit by government efforts to rein in high levels of debt with the aim of putting the vast economy on more stable footing. Momentum has also been blunted by the trade war with the United States, which has led to tariffs on hundreds of billions of dollars in Chinese exports. Wang, for his part, took a glass-half-full view of the data. 'I think [6.6%] is a pretty significant number,' he said. 'Not low. At all.'" Forbes Coal Isn't Dead. China Proves It. The Diplomat Two Stealth Bombers for the Chinese People's Liberation Army Air Force?